Longchenpa (Tib. ཀློང་ཆེན་པ་, Wyl. klong chen pa), also known as Longchen Rabjam (Tib. ཀློང་ཆེན་རབ་འབྱམས་, klong chen rab 'byams), ‘Infinite, Vast Expanse of Space’, or Drimé Özer (1308-1364), was one of the most brilliant teachers of the Nyingma lineage. He systematized the Nyingma teachings in his ‘Seven Treasures’ and wrote extensively on Dzogchen. 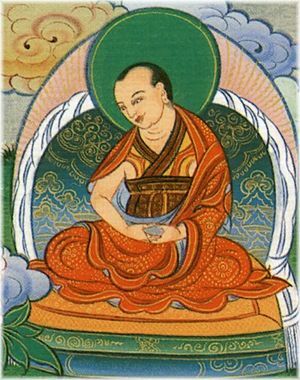 He transmitted the Longchen Nyingtik cycle of teachings and practice to Jikmé Lingpa, and it has since become one of the most widely practised of traditions. The immediate reincarnation of Pema Ledreltsal, Longchenpa is regarded as an indirect incarnation of the princess Pema Sal. He was born in the Tra Valley of Southern Tibet to master Tenpasung, an adept at both the sciences and the practice of mantra, and Dromza Sonamgyen, who was descended from the family of Dromtönpa Gyalwé Jungné. Longchenpa was first ordained at the age of eleven and studied extensively with the Third Karmapa, Rangjung Dorje. He received not only the Nyingma transmissions as passed down in his family, but also studied with many of the great teachers of his day. He received the combined Kadam and Sakya teachings of the Sutrayana through his main Sakya teacher, Lama Dampa Sonam Gyaltsen, in addition to the corpus of both old and new translation tantras. At the age of nineteen, Longchenpa entered the famous shedra Sangphu Neuthok, where he acquired great scholarly wisdom. He later chose to practise in the solitude of the mountains, after becoming disillusioned by the behaviour of some scholars. During his late twenties two events occurred that were to be of decisive importance in his intellectual and spiritual development. One was a vision of Guru Padmasambhava and Yeshe Tsogyal, and the other was his meeting with the great Rigdzin Kumaradza. It was in the mountains that he met Rigdzin Kumaradza, who was travelling from valley to valley leading his students through the most difficult of circumstances. Together with Rangjung Dorje, Longchenpa accompanied them for two years, during which time he received all of Rigdzin Kumaradza's transmissions and underwent tremendous hardship. After several years in retreat, Lonchenpa attracted more and more students, even though he had spent nearly all of his life in mountain caves. During a stay in Bhutan (Tib. Mon), Longchenpa founded several monasteries, including Tharpaling near Bumthang, and fathered two children, his son Tulku Drakpa Özer (b. 1356), going on to become a holder of the Nyingtik lineage. The figure of Longchen Rabjam stands out as one of the greatest Dzogchen masters in the Nyingma tradition, and amongst the most brilliant and original writers in Tibetan Buddhist literature. He was the author of over 200 works, of which only about twenty-five survive, and amongst which the Seven Treasuries (Tib. མཛོད་བདུན་ Dzö Dun) and Three Trilogies are most well-known. It was he who brought together into a cohesive system the teachings of Vima Nyingtik and Khandro Nyingtik, on which he wrote the ‘Three Yangtik’ or Inner Essences. Dorje Ziji (Tib. རྡོ་རྗེ་གཟི་བརྗིད་, rdo rje gzi brjid) for writings common to both outer and inner tantras. Drimé Özer (Tib. དྲི་མེད་འོད་ཟེར་, dri med 'od zer) for writings on profound subjects and especially the stages of meditation. Longchen Rabjam (Tib. ཀློང་ཆེན་རབ་འབྱམས་, klong chen rab 'byams) for writings in which the inconceivable nature is taught in detail. 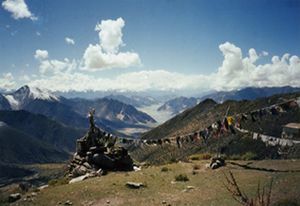 Kunkhyen Ngakgi Wangpo (Tib. ཀུན་མཁྱེན་ངག་གི་དབང་པོ་, kun mkhyen ngag gi dbang po) for writings in which the various yanas and views are explained in detail. Tsultrim Lodrö (Tib. ཚུལ་ཁྲིམས་བློ་གྲོས་, tshul khrims blo gros) or Samyepa Tsultrim Lodrö, for writings on the outer sciences. Tulku Thondup, Masters of Meditation and Miracles, Shambhala, pages 109-117. This page was last edited on 2 September 2018, at 14:47.